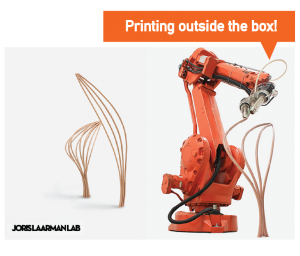 Joris Laarman LAB is using 3D-printing techniques in most of their project. Sometimes just as a design tool, but increasingly also for actual functional prototypes. Frustration about the absurd high cost of 3D-printing and the lack of large enough building volumes led them to the development of the MX3D-program. MX3D stands for Multi Axis 3D Printing. By combining Industrial robots with different printing tools, they can now print large structures in many materials such as thermoset plastics or even Stainless steel and Aluminium. BIO | After study mechanical engineering, Tim Geurtjens (1976) attended the Design Academy Eindhoven in 2003 where he graduated 4 years later. Since then he has been working as CTO for Joris Laarman Lab, best known for its experimental designs inspired by upcoming technology. Over the last 6 years he developed extensive knowledge of exotic materials and cutting edge technologies, specifically novel digital fabrication methods. Tim is co-founder of MX3D, a company that developed several large-scale 3D printers that use 6-axis industrial robots. These printers allow them to print very large structures in many different materials such as thermoset plastics, stainless steel or aluminium. Heidi Sohn, Henriette Bier, Andrej Radman, Stavros Kousoulas and Jasper Schaap. Day One: Legermuseum, Korte Geer 1,Delft. Day Two: Berlagezaal, Faculty of Architecture and the Built Environment, Julianalaan 134, Delft. 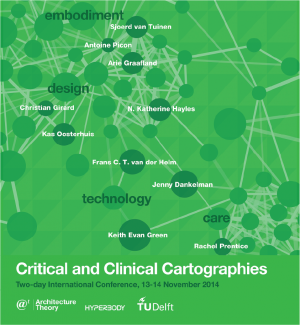 Jenny Dankelman, Christian Girard, Arie Graafland, Keith Evan Green, N. Katherine Hayles, Frans C. T. van der Helm, Kas Oosterhuis, Antoine Picon, Rachel Prentice and Sjoerd van Tuinen. OUTLINE | The conference on Embodiment and Technology and Care and Design is organised by the Theory Section and Hyperbody of the TU Delft Architecture Department, in cooperation with Industrial Design Designing Health Research programme, and the Bio Mechatronics and Bio Robotics Section of the Department of Bio Mechanical Engineering, TU Delft. The classical engineering material-by-design approach has been extensively perfected by materials scientists, while engineers have been optimising structures geometrically for centuries. The purpose of architectured materials is to build bridges accross the microscale of materials and the macroscale of engineering structures, to put some geometry in the microstructure. This is a paradigm shift. Materials cannot be considered monolithic anymore. 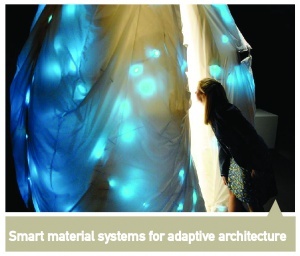 Any set of materials functions, even antagonistic ones, can be envisaged in the future. 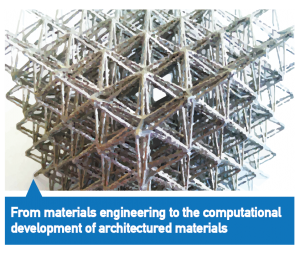 The development of architectured materials is involving materials scientists, metallurgists, chemists, physicists, mechanicians and engineers, but also biologists, computer scientists, architects, designers, mathematicians, plasticians, etc. In this presentation, we intend to demonstrate the necessity of computational means for developing architectured materials, especially using virtual material design, topology optimization and so-called "computational experiments". BIO | Justin Dirrenberger is a materials scientist and Associate Professor of metallurgy at CNAM in Paris. In 2012, he completed a PhD thesis on the mechanics of architectured materials at Ecole des Mines de Paris. In 2013, he collaborated with EZCT Architecture & Design Research for Archilab, as a materials processing and structural engineering consultant. Recently, he initiated a graduate program on materials & additive manufacturing in Paris, open to both engineering and architecture students. He is leading the DEMOCRITE research project, funded by heSam Université, between CNAM, Arts et Métiers-ParisTech, ENSA Paris-Malaquais, ENSCI-Les Ateliers, and INRIA, aiming at developing additive manufacturing at the architectural scale. His research interests are related to the morphological structures of matter at different scales within materials. He is particularly involved in the design, modelling, simulation, optimisation, and processing of architectured materials, which result from the unholy alliance between metallurgy, mechanics, and geometry. The built environment, made intelligent and adaptable by embedded robotics, has great promise to support and augment the lives of people. 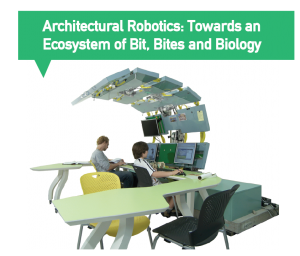 This talk introduces my efforts to develop cyber-physical, built environments – “Architectural Robotics” – characterized as elegant, artful, meticulous, user-friendly and robust. The novelty of this research lies in its recognition of the physical, built environment, from furniture to the metropolis, as a next frontier of computing. Briefly, I will present the motivations and theoretical underpinnings for the research, and introduce three case studies supporting healthcare, education, and working life. My lab group strives to realize cyber-physical environments that cultivate interactions across people and their surroundings toward creating meaningful places of social, cultural and psychological significance. BIO | Keith Evan Green is Professor at Clemson University [USA] with a joint appointment in Architecture and Electrical & Computer Engineering. 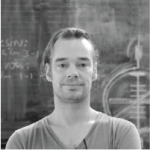 His research focuses on designing, prototyping and evaluating “Architectural Robotics” – intelligent and adaptable built environments for an increasingly digital society. He earned B.A., M.S. and Ph.D. degrees from the University of Pennsylvania, and an M.Arch. from the University of Illinois at Chicago. The US National Science Foundation frequently supports his research activities. Green has supervised more than thirty Masters and Ph.D. student theses. He has an extensive record as author, peer-reviewer and program committee member for ACM and IEEE conferences and journals. - Mitchell, William, J. "Computers for Living In” in e-topia. Cambridge, MA: MIT, 2000, chapter 4. - Negroponte, N. “Intelligent Environments,” Soft Architecture Machines, Cambridge, MA: MIT, 1975. - Houayek, H, Green, K. E., Gugerty, L. Walker, I. D. and Witte, J. "AWE: An Animated Work Environment for Working with Physical and Digital Tools and Artifacts." In Journal of Personal and Ubiquitous Computing [JPUC], June 2014, Volume 18, Issue 5, pp. 1227–1241. PROFILE | TEUFFEL ENGINEERING CONSULTANTS provide consultancy services to architects and clients to develop optimized structural systems. This is achieved by a close interaction between the creative design process and advanced analysis techniques. Our structural solutions employ traditional materials like steel and reinforced concrete as well as new materials such as glass and membranes. The ambition is to develop projects, where technical perfection and aesthetic quality are combined with economic concerns. The company was founded in 2003 by Prof. Dr.Ing. Patrick Teuffel and is based in Stuttgart and since 2013 in Berlin as well. This page was last modified on 8 April 2015, at 14:05.